Ayla Albayrak in The Wall Street Journal. Turkish Internet users deployed one of the country’s most piercing weapons against government attempts to block Twitter late Thursday: humor. Many of Turkey’s estimated 10 million Twitter account holders reacted to the ban by concocting ironic jokes and posting pictures lampooning the government. Dozens of graphic-art pieces—many using the Twitter logo and the Turkish flag to satirize and attack the ban—emerged almost immediately. 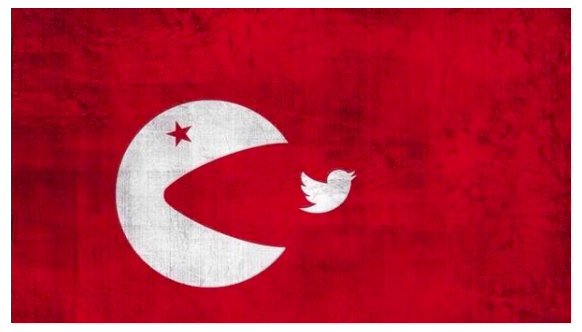 One image replaced the crescent and star on Turkey’s flag with an open-jawed Pac-Man trying to eat the Twitter bird. 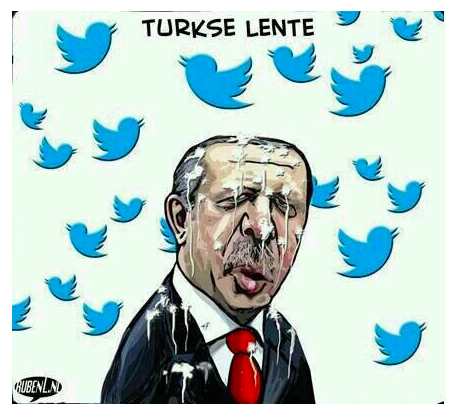 Another showed circling Twitter birds covering the head of Prime Minister Recep Tayyip Erdogan in droppings. Tweets sent in Turkey are up 138% on Friday a day after the country’s Twitter ban, according to data published Friday by Brandwatch, a firm that analyzes social-media analytics. The data, which took a sample set of geolocated tweets over a two-hour period, underscored how the ban appears to be backfiring. Analysts say the ban was aimed at preventing the publication of recordings of alleged telephone conversations between Erdogan, Turkish officials and media bosses, revealing the scope of government intervention into all spheres of life and suggesting widespread high-level corruption, prior to critical local elections March 30. Such recordings have been anonymously published on social media almost daily. Public criticism and pressure against the government has mounted, especially during antigovernment protests in June and after a corruption investigation in December, which also involved four former ministers. 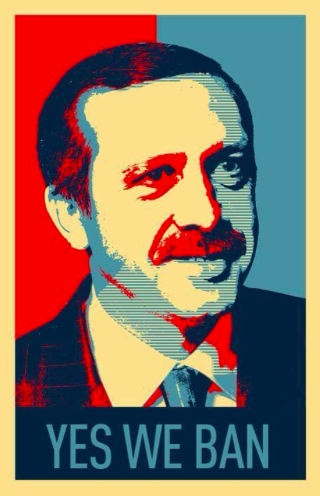 Now, political satire has taken over social media in Turkey in a way unseen for years, analysts say. “Political satire has always been very strong in Turkey, especially during times of high political polarization and in the 1970s. Now it’s back after the wall of fear has been surmounted,” said Sinan Ulgen, a former Turkish diplomat now with the Carnegie Endowment for International Peace. Even five years ago, he said, Turks were more wary of expressing criticism against the government in any way, including humor. “The purpose of satirical tweets is to spread political messages with a more understandable, popular and striking way,” Ulgen said. 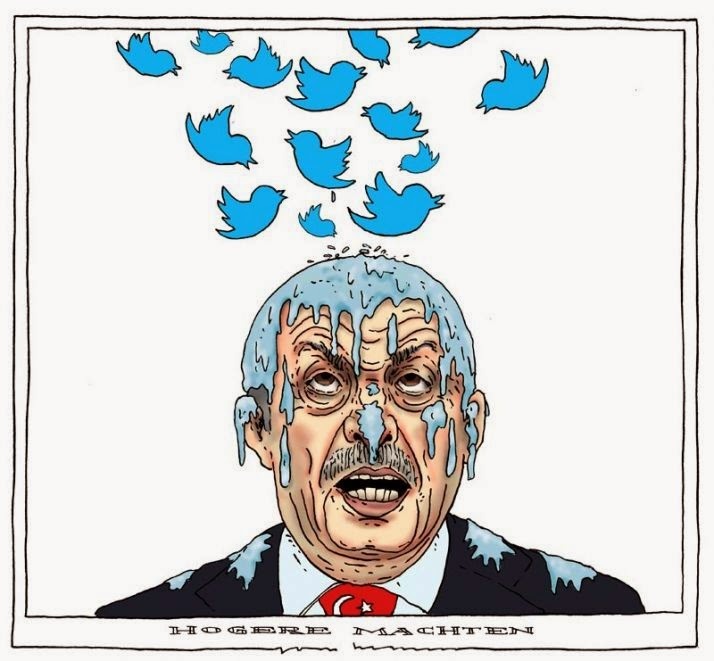 Erdogan, who has sued scores of citizens and caricaturists over the years for making fun of him, wasn’t available for comment Friday over the Twitter closure. While Turkish researchers suggest that only a small percentage of supporters of the ruling AKP party regularly use the Internet, some young AKP supporters approve of restrictions, saying they feel personally insulted by harsh criticism against the government. Thank you for your understanding sensitive journalism.